"Imagine this fairy-like Temple blazing like sunlight among those savage black rocks." Frederic Edwin Church's landscape paintings offer us the pious and the exotic, the natural and the artificial, in equal measure. He was a vital figure in the movement in American painting known as the Hudson River School, and in the development of Western landscape painting more generally, and his work epitomizes all the contradictions of the culture that birthed it. A technically ingenious draftsman, interested in the accurate rendering of flora, fauna, and atmospheric effects, he was also aware of the value of illusion, often building up his landscapes from preparatory sketches made at several different sites. His subject-matter ranged from New York State to the Arctic and the Andes. To each location he brought the same heady combination of religious awe, scientific inquisitiveness, and a fascination with the exotic. Frederic Edwin Church was one of the most gifted painters of light and air of the Romantic period. His work became renowned not only for its meticulous rendering of landscape, but for the equal attention it lavished on sunlight, moonlight, cloud, mist, and other intangible qualities of location. In this sense, his work is related to the subgenre of American Romantic landscape painting known as Luminism, though it lacks that style's emphasis on calm and stillness. If Thomas Cole's paintings made the Hudson River Valley famous, Frederic Edwin Church made the painters of the Hudson River Valley famous for painting the world. Whereas Cole's travels were restricted largely to the United States, Church's artistic tours took him to exotic and remote locations, from the Arctic Circle to the Middle East. His oeuvre is synonymous with the confident, inquisitive, sometimes astonished gaze of the nineteenth century West upon the rest of the world, and pulsates with the energy of discovery. As a member of the second generation of Hudson River School painters, Church's work enacts a movement away from the symbolic unity of the first-generation painters such as Cole - in which each element of the landscape has a coded allegorical value - towards a purer emphasis on the natural scene. This went hand in hand with a desire to document, taxonomize and understand the landscape at a scientific level. 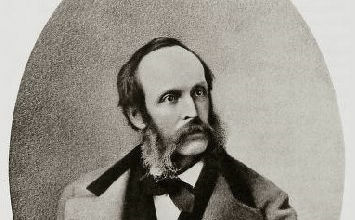 Frederic Edwin Church was born into a mercantile family in Connecticut in 1826. Though his ancestors were amongst the Protestant founding fathers of the United States, his immediate heritage was rather more prosaic. His father and uncle made a living from manufacturing bonnets, and from other business ventures including milling and insurance. 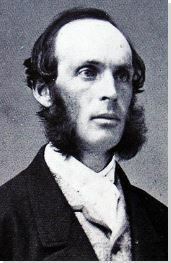 Nonetheless, Church's father was wealthy and well-connected, and when his son showed an early talent for art he arranged through his contact Daniel Wadsworth, a noted Connecticut collector, for Frederic to study under the painter Thomas Cole. This atmospheric sunrise is exemplary of Church's early work, and of the influence of Thomas Cole in particular. In keeping with Church's Romantic heritage, the piece is subtly but carefully composed. A crescent-like break in the rocky terrain opens out onto the Valley, as the silver sliver of the Hudson River glistens far below. The clouds are streaked with reddish light, while the figure in the foreground - turned away from the viewer to observe the landscape, a motif familiar from earlier European works such as Caspar David Friedrich's Wanderer above the Sea of Fog (c. 1818) - contemplates the world spread out before him. His presence serves as a fulcrum, offering the viewer a point of access into the scene, and presenting the landscape as a vessel for human desires and expectations. The landscape of upstate New York was of vital significance to the American school of landscape painting that coalesced around the figure of Thomas Cole during the 1820s-40s. Cole, Church's artistic and spiritual mentor, had been visiting the Hudson Valley since 1825 to make sketches for his work. In paintings of Cole's like The Oxbow (1835-6), the landscape is at once depicted in hyper-naturalistic detail and presented as a symbol of all the hopes and contradictions of American settler culture. Church, like Cole, was a devout Protestant, and his early landscapes show the same coded engagement with themes such as Manifest Destiny. This scene in particular, presents ample opportunities for spiritual or symbolic allusion by playing on the relationship between the river plane below and mountains above and beyond. However, in works such as Morning we can already sense a pronounced emphasis on atmospheric effects which is largely absent from Cole's work, and which would become more striking in the sublime works of Church's maturity. His handling of the American wilderness in this early work reflects a distinctively American order of Romanticism still coming into focus in the mid-nineteenth century. This is the largest and most significant of the works that Church made following two visits to South America in 1853 and 1857. The painting is three meters wide, and presents a welter of fauna, most notably in the foreground, where several plants are rendered with exacting detail. One area of acute visual interest is the clump of silver-barked trees to the right. Projecting precariously over the central pool of water, their roots extend into thin air. Curious details like must surely be based on direct observation, and help to generate a peculiar visual intensity only found in a handful of other painters' work at this time. Church's trips to the Andes were partly inspired by the naturalist and polymath Alexander von Humboldt, whose South American travelogue from the early nineteenth century was a well-known work in Church's day. On 9 May, 1859 Frederic wrote to a friend that he should like to have the recently completed canvas of The Heart of the Andes shipped to Germany so that he might provide the elderly Humboldt with "a transcript of the scenery which delighted his eyes sixty years ago." This suggests that Church regarded landscape painting, at least in part, as a means of passing onto the viewer a sensation faithful to that generated by original encounter with a scene. To that end, however, he was not entirely ingenous in his recreation of particular landscapes. Key elements of this composition seem to follow the conventions of the Romantic landscape genre rather than the details of topography, such as the layering of foreground (the detailed plants), middle ground (the jungle and plane), and background (the towering rugged mountains). Nonetheless, Church made brilliant use of these conventions, building his pictures up from a series of detailed sketches. Ironically, Humboldt passed away on 6 May 1959, just three days before Church penned his letter to his friend. Nevertheless, in contemplating The Heart of the Andes, we get a concentrated, dramatized sense of what the lone traveller might have felt on his first encounter with the grand ridges and peaks of the South-American interior. Though highly unusual in the context of Church's wider output, this is arguably one of the artist's most personally revealing works. Our Banner in the Sky is thought to have been executed in the year that war broke out between the Unionist and Confederate forces. A break in the evening clouds, set in front of a blue, star-filled sky striped with red light, forms the image of the Union flag, with a dead tree in the foreground serving as makeshift flagpole. This is an overt - not to say overdone - visual allusion to the Civil War, and provides an obvious indication of Church's allegiances in that conflict. Born and raised in the Federal-supporting north - having spent his early life in Connectictut, moving to New York State in 1849 - Church may even have been referring with this work to a specific event in the early stages of the war. Fort Sumter, a sea fort in South Carolina, was the site of the first battle of the Civil War, a defeat for the Federal forces who held out against a Confederate siege lasting more than thirty hours. It has been suggested that Church's tattered flag represents the wartorn stars-and-stripes which still hung over the fort following the battle, a symbol of defiance and hope that a united America would eventually win out. In offering such an overt symbolic conceit, Church stepped outside the general pattern of developmet which characterizes his work. The art historian Jennifer Raab has suggested that Church moved throughout his career towards a naturalistic accuracy, "challeng[ing] an earlier model of painting based on symbolic unity". Yet here, Church uses visual allegory to make a clear political point, indicating the personal significance of the theme, and his almost spiritual belief in the future unity of his nation. This painting depicts the Aurora Borealis or Northern Lights flickering over the icy wastes of the Arctic. The dancing light in the sky, captured with extraordinary sensitivity, indicates Church's talent for developing formal techniques which accurately relayed complex and subtle atmospheric phenomena. Amid a wash of blue, yellow, and red, a distinct but meandering line is traced across the sky. This work was inspired by a visit to the Arctic undertaken by Church's friend, the explorer Isaac Israel Hayes, whose account of his voyage was published as The Open Polar Sea in 1867. Hayes made provisional sketches of what he saw which, in combination with the details of his written narrative, provided Church with his source-material. As the critic John K. Howat has noted, the picture is "an evocative rather than exact duplication of any specific scenario", recreating the general mood of Hayes's narrative and sketches. It has been incorrectly suggested that the small boat in the left foreground represents Hayes's vessel, but at no point did his own expedition become locked in ice. Church's use of Hayes's material for his own creative projects suggests a good-natured exchange between friends, but also a scholarly give-and-take, with both men profiting from the other's talents and resources (this painting functioned, amongst other things, to publicize Hayes's writing). As scholars such as Jennifer Raab have stated, pictures like Aurora Borealis indicate Church's interest in visually recreating atmospheric and light effects with scientific accuracy. It is also clear however, that he was able to combine this technical fidelity with an extraordinary affinity for rhapsodic qualities of mood. Aurora Borealis can therefore be seen as bringing together a range of contemporary perspectives on its subject-matter, speaking to both the pioneering scientific spirit and awe-seeking Romantic sensiblities of its age. This huge work represents Church's most significant contribution to landscape painting in the high Sublime style, an approach which originated in England in the late eighteenth century with the work of J.M.W. Turner and others. Intending to impress upon his viewers a sense of the enormity of his subject-matter, Church perhaps felt that the most effective tool at his disposal was scale. As such, this painting is more than two-and-a-half meters tall, with the viewer perched, as it were, on a rocky outcrop at the mouth of the falls, the eye drawn down and across into depths recreated with vertiginous accuracy. The function of the Sublime in art was to transport the viewer with an overwhelming sense of vastness, an inhuman vastness which was both inspiring and terrifying, taking them briefly out of their own bodies. This painting can be regarded as an artistic recreation of the Sublime quality of the Falls themselves: Church sought to immerse his viewers in an experience analogous to that of experiencing the cascade in person, hearing the rush of water, feeling the spray of mist. The marginalized line of the horizon is important in this sense, consuming the gaze in a tumult of flowing water. Church had been visiting and painting the Niagara Falls since the 1850s, making oil sketches of the site during visits in 1857 and 1858. A full-scale painting made during one of those visits, Niagara (1857), is horizontally disposed, emphasizing the flow of water towards and over the edge of the precipice. In this later work, Church's focus shifts towards the huge cloud of spray at the foot of the falls. A less definite, more suggestive subject, the spray forms a dense and impenetrable mass at the center of the picture, suggesting an intelligent discourse in Church's work between detailed description, on one hand, and allusion and affective atmosphere, on the other. Indeed, this work seems to undermine the criticism of Church's contemporary John Ruskin, who wrote dismissively that "[Church] can draw clouds as few men can, though he does not know yet what painting means, and I suppose he never will." This is one of several painting that Church created following his travels across the Middle East during the late 1860s and early 1870s. Capturing perhaps for the first time a vista now familiar from various pop-culture references, Church offers a dramatic glimpse of the neoclassical columns of Petra emerging from dark, towering avenues of stone. The revelation of the building's façade is ingeniously managed, the irregular outline of the adjoining rock-faces creating a jagged frame around the building, directing the eye inwards. In the foreground, a small area of path seems to invite us into the image; indeed, the framing and angles are carefully managed to suggest the perspective of a viewer approaching on foot. Having spent eighteen months in Europe and the Middle East from Autumn 1867 onwards, Church returned home full of ideas that would occupy him for several years thereafter. His eastward journeys took him to the holy land - like his teacher Thomas Cole, Church was a devout Protestant - and to the Greco-Roman ruins of the ancient Middle East, including the ancient city of Petra in Jordan. The building depicted here, El Khasné ("The Treasury"), was so named in the nineteenth century, but was in fact a temple and a mausoleum for the Nabatean king who oversaw its construction. The critic Jackie Wullschlager has described Church's work as offering "piety as visual imagination, a pre-Darwinian sense of harmonious design yet a scientist's accuracy and a pioneer's thrill of place: Church intrigues as a historical record of the mindset of mid-19th-century America." This sums up heady historical and intellectual conditions that underpinned the composition of works such as El Khasné, Petra. At one level, the painting functions as an aesthetically pleasurable object; upon its completion, Church gifted it to his wife Isabel, and it still hangs in the sitting room at Olana. On the other hand, it suggests the uncomprehending wonder felt by Church and others like him on encountering the ancient past of the Middle East, a wonder colored by the impending intellectual relativism and religious crises of the late nineteenth century. The compositional treatment of the ruined façade captures this sense of awe perfectly, its dazzling emergence signaling not only a visual but an imaginative discovery. Interstingly, to this day, this is the most famous, post-card-type, view of Petra that any and all tourists to the site are likely to take away from their visit.